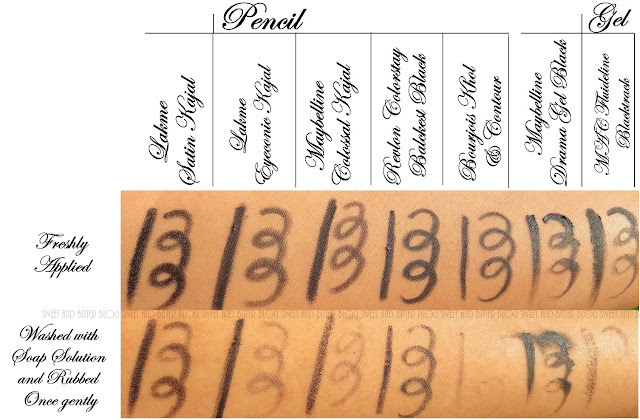 Lakme Satin Kajal – Before all the Jumbo pencils, Lakme has its own. I have seen that one in my Mom’s vanity since I could remember. Then recently they hiked the price and relaunched them with the graphical designs. The old one is still sold for just INR 50 but most big stores try not to store them. As most girls in India started with this pencil kohls it holds a lot of emotions. Lakme Eyeconic – Recently they were launched by Lakme. The launch involved a huge hype and it lived up to it. It comes in a twist-up pencil so no wastage of product while sharpening. Smudgeproof - No. It smudges a little around the corner. Maybelline Colossal Kajal – Before Lakme launched its eyeconic range of mascara and Kajal, the Indian market was ruled by this one. A twist up yellow body pencil for just 150 INR (now INR 199) was something everyone loved. Bourjois Kohl – It’s the worst of the kohl that are mentioned here. I did a review for why NOT to buy this one here. Revlon One Stoke – If sharpening does not bother you then buy this. The blackest black eyeliner in pencil form. Super long intense stay. Even one of my friend who has super oily eyelids loves this one as this is the only one which stays on her eyelids for long with full color. I got it more than a year back. Fell in Love, got another one for backup as it seemed very soft and I thought I will finish it in a month. Well, guess what? I am yet to finish the first one! Waterproof – Yes – Best in its class. Maybelline Drama Gel Black - When girls with shaky hands thought pencils could poke their eyes and liquid liner are not forgiving to even the tiniest mistake - they discovered Maybelline Drama Gel Liner. Many who were used to applying eyeliner on their waterline, used this on their waterline as well. Most faced irritated eyes but then one colleague told me - try it for a week and then your eyes get used to this. *Horror Face* I do not know how many girls are brave enough for this stunt! This is the first gel liners that most used. USP - Comes with a free eye brush which is apt for daily and cat eye looks. MAC Fluideline Blacktrack - But if you cannot deal with the irritation from Maybelline then let me introduce you to this one - MAC Fluidline Blacktrack. It was my first MAC product and I loved it. It is the smoothest of all gel liners and of all MAC Fluidlines - a must have from MAC as rated by Temptalia! Waterproof – No and does not even claim to be! 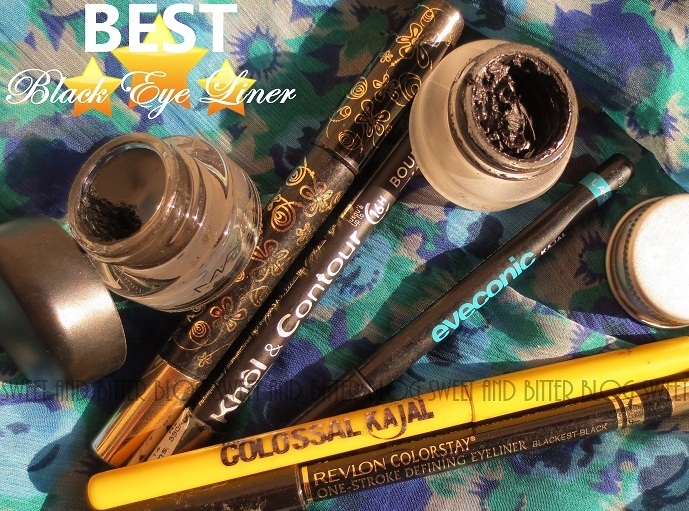 Other Gel Liners In India- I have also tried the L'oreal gel liner one but I was not happy at all. Plus, for that price, you can throw in some extra and get something from a REAL premium brand! Inglot also retails gel liners in an array of colors but it dries up into a hard rock most of the time and then you have to buy another product from them to make their product work. Duh! I have also seen in Revlon but I am not all impressed by them. Another name that comes to mind - something that almost every Indian girl has brought at least once in their life is the Lakme liquid liner. It has an awesome thin brush, looks a bit like thick black water, comes inside a nail polish type bottle but, Lady if you have steady hands then nothing is better than that for sure! B. How many Indians actually use them compared to the drugstore ones? Seriously...how many? Which Black Kohl or Eyeliner do you swear by? Please share. I would love to know more and discover more. Thanks dear. I surely need to try Lakme Kohl Ultimate as I have heard a lot about it by now. Clinique quickliner! It is a godsend for every girl with oily lids. It isn't the most pigmented but stays on for ever! I'm really keen on trying the some glossy liners now. Lucky that you found your match! I just hope MAC was waterproof - it would have been the ultimate unbeatable black eyeliner that way. this post was really useful! gonna buy the Revlon one. Thanks! me voting for MAybelline Gel liner..